The emails, compiled by #DDoSecrets, identify Bradley Foundation VP Dan Schmidt on a list of ~140 individuals relating to a Sept. 2014 Moscow gala. 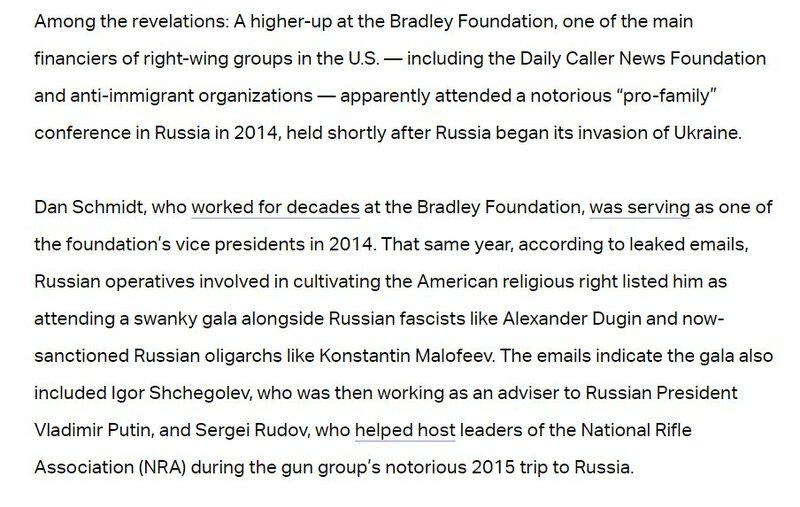 In addition to Dugin and Malofeev, the list included a Putin adviser and one of the Russians who helped host the @NRA in Moscow. It's the end of the year, so I suppose it's time to take stock: I'm exhausted. In many ways, it's seen more successes than I expected. #DDoSecrets launched and has some great stuff in the works. A public ORIS is well on its way to being a reality, thanks largely to @hexadecim8. I've begun working on a lot of projects that I never thought would see the light of day, and I'm relieved that many of the tools and resources I've wanted to leave the public are under development (not all of which involve me, some I'm simply a spectator for).